Dr. Faiz Albakshy graduated from King Faisal University in Saudi Arabia and went on completing his postdoctoral internal medicine residency training in the University of Toronto, Canada in 1997. 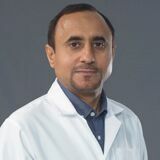 Dr. Faiz pursued Adult Cardiovascular level 3 Echocardiography and level 2 Nuclear Cardiology fellowship training in Baylor College of Medicine in 2003. Then he did his Interventional Cardiology fellowship in Mount Siani Hospital, NY, USA in 2005. He is an active fellow of the American College of Cardiology, the Society for Coronary Angiography and Interventions and the Royal College of Physicians and Surgeons of Canada. Dr. Faiz is consultant interventional and non-invasive cardiologist since 2005. He performed thousands of diagnostic coronary angiograms and angioplasty procedures, and various non-invasive cardiac testings such as ECG, Echocardiography (TTE,TEE), exercise, dobutamine and nuclear stress. Also he performs interpretation of ambulatory blood pressure and ambulatory ECG monitoring. He has worked in Saudi Arabia and Kuwait. He has special interest in bifurcation coronary interventions, primary angioplasty, and acute coronary syndrome. Dr. Faiz speaks Arabic and English very fluently.